Both studies showed that ADD behaviours were reduced significantly and reading improved with AVE . Michael used the DAVID’s unique patented field stimulation ability to generate a different frequency in each hemisphere of the brain. With this technique and a Symptom Survey checklist developed by Michael, he was able to create DAVID sessions that could stimulate or calm the left, right or both hemispheres depending on the symptoms checked off by the child’s parents. Over time, Michael has refined and developed these sessions based on the checklist toproduce benefits in specific areas. Now, all of this expertise has been put into the DAVID ALERT. Tru-Vu OmniscreenTM Eyesets – Our unique Tru-Vu OmniscreenTM Eyesets were carefully designed to provide you with the most effective and safe light and sound experience. The Tru-Vu OmniscreenTM Eyesets for the PAL use eight blue-tinted white LEDs mounted over a silver reflector behind a translucent screen. This disperses the light evenly. Our new Tru-Vu OmniscreenTM Eyesets are specially designed to allow for the left and right visual fields of each eye to be individually stimulated rather than the entire eye. With the Tru-Vu OmniscreenTM Eyesets, the lights flash into the left visual fields of both eyes, then alternately flashes into the right visual fields of both eyes. This approach allows the ability to stimulate either visual cortex with a frequency different from the other visual cortex. For example, a person who functions strongly from the left brain could have 8 Hz stimulated into the right visual field (and therefore the left brain) to slow down left brain function and have 18 Hz stimulated into the left visual field to increase right brain function. Isochronic Pulsed Tones, Binaural Beats and Chime – The tones of the DAVID ALERT are evenly spaced, are of equal pitch and are turned on and off at a specified rate. This is important to enhance the effectiveness of audio entrainment. Easy-To-Find Intensity and Volume Buttons – The intensity and volume buttons are raised so that you can make the necessary adjustments easily and quickly, even with your eyes closed. Adjust the intensity of the OmniscreenTM Eyeset with the easy-to-find INT button. 24 Preset Sessions – Sessions grouped into convenient categories (Left Hemisphere, Right Hemisphere, Whole Brain, Meditator, Toolbox, Sound Sync, User Defined). 11 of the sessions were designed by Michael Joyce exclusively for the ALERT. The remaining session are our very favourites from the DAVID series. LoopLogic Hz Dual Independent Binaural Beat MP3 Session Generator is an instant download MP3 file set broken into Gamma, High Beta, Beta, SMR, Alpha, Theta and Delta audio brainwave frequency categories. Each of the 37 tracks represent one hertz within each category and is created with dual independent binaural beat frequencies. 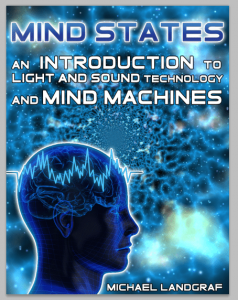 Simply add these frequency tracks to your MP3 Player or playlist and program your playlist to create custom audio brainwave entrainment sessions. Christopher Oliver and Michael Landgraf developed these 515 LoopLogic MP3 tracks for targeting specific frequencies within all brainwave states, enabling you to create personally designed sessions for use with eeg/neurofeedback training, incorporating into music, entraining audiences during presentations, physical workouts, meditation or for just making a good thing better. Applying these sessions have endless beneficial possibilities so use your imagination! Imagine combining these one hertz tracks as a sleep aid or for relaxation or adding to your learning, memory or creative skills! Weight Loss Series: There is no specific timetable for how long you should listen to each step. Some people may find listening to each session for only a few days or a week to suffice, others will want more time. That is only normal, after all, we all think differently, all react differently, so listen to your inner-voice and decide for yourself just how long listening to each particular session best meets your specific needs… Lose weight step 1 is a 15 minute session to assist you in beginning your weight loss program. Combining suggestions, nature, music and tones, this session is designed to get you off on the right path. Lose weight step 2 is a 25 minute session, using the same approach as step 1, that will further strengthen your resolve to be a trimmer you. Lose weight step 3 will help you fight the urge to diverge from your goal. This 8 minute session is a powerful weight loss booster. Lose weight step 4 is the final stage in your quest for losing weight. 8 minutes in length, this session will help you maintain the motivation to meet your goal.